Binti: The Night Masquerade is the conclusion to Nnedi Okorafor’s spellbinding series of novellas. It follows directly on from Binti: Home, which may come as a relief to readers anxious about the cliff-hanger ending. There’s a lot packed into this novella, which is reflective of the many identities with which Binti is coming to terms. It’s a story that put me in mind of the lines from Walt Whitman’s “Song of Myself”: Do I contradict myself?/ Very well, I contradict myself;/ (I am large, I contain multitudes.) Like the poem, Binti contains many identities, with each book adding more. 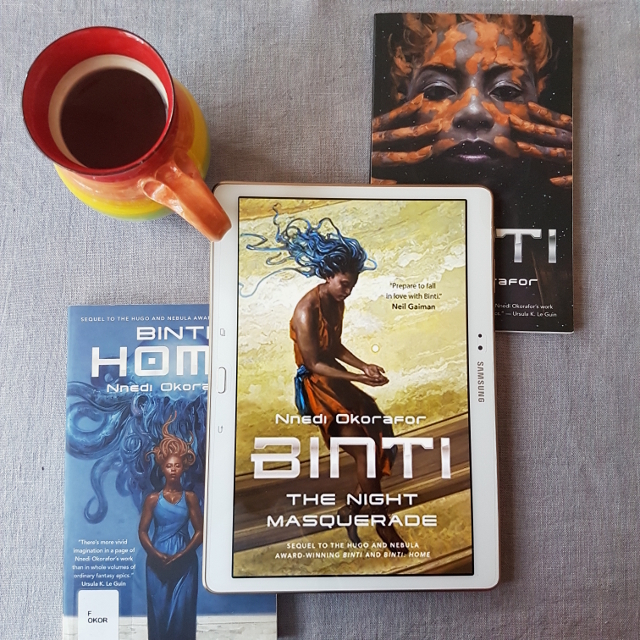 These identities don’t always sit easily together; in The Night Masquerade, we see more of how the angry, warlike Meduse part of Binti conflicts with her identity as a harmonizer. We also see Binti exploring her heritage as one of the Desert People, a minority she has been taught to look down on. These conflicting identities make Binti a complex and interesting character. One of my favourite things about this book was the way Binti isn’t above reproach. She has flaws, makes assumptions and mistakes. However, she learns from these and strives to do better and treat others with respect. This internal exploration is balanced with external conflict, as fighting between the Khoush and the Meduse breaks out once more. This aspect of the book touches on themes of good faith and the impact large warring forces have on the individuals around them (and vice versa). It’s a violent story, but this is in keeping with the series–particularly the first book. The settings throughout the book were evocative, forming characters in their own right. The desert in particular has a wonderful presence, conveying the sense of home Binti feels. There were a number of twists in the last third of the book. Not all of them worked for me, though I did find them thought-provoking. Overall, Binti: The Night Masquerade was a satisfying conclusion to what has been a fascinating trilogy. I need to get back to this trilogy. I haven’t read the second one yet. I’d read the last two back-to-back if you can manage it. The cliff-hanger is a bit rough.